Seranthony Dominguez sputtered in relief in the second game of the doubleheader, allowing two hits and three runs with three walks in the eighth and ninth. 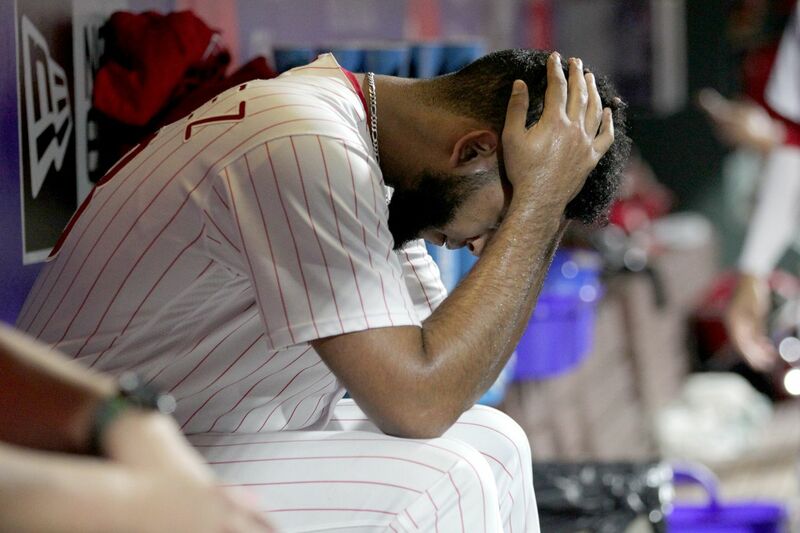 The first two batters reached base in the ninth inning on Tuesday night at Citizens Bank Park and it appeared for a moment that the Phillies were going to do exactly what Gabe Kapler said they would do just a few hours earlier: turn the page. The Phillies limped through first game of Tuesday's doubleheader against the Nationals and then watched their bullpen turn a three-run lead into a tie game in the top of the ninth of the nightcap. But here they were, ready to turn the page. But the page never turned. The rally fizzled and a 7-6 loss would soon be sealed. It was the type of day that felt to be enough to finish the team's season. The Phillies have lost 22 of their last 33 games. They have not won a series since August 5, and Tuesday's results mean another series loss is secured — they are 0-10-1 in their last 11 series. That is not exactly the way division titles are won. The Braves won shortly after the Phillies collapsed and increased their first-place lead to 6½ games. The Braves are pulling away as the Phillies spin their tires. "I'm not going to sugarcoat it; we are not playing good baseball right now," Kapler said. "It is our job to stay the course, it's our job to stay unemotional, it's our job to not panic, specifically my job. And all we can do is put our heads down, work hard tomorrow and prepare for the next game. And that's what we'll do. We will get better." The final blow came from a home run by Nationals rookie sensation Juan Soto off Yacksel Rios in the 10th. Soto homered in the fourth off Jake Arrieta and finished the doubleheader with five hits and four RBIs. But the real heartache came an inning earlier when the Nationals peppered Seranthony Dominguez. The Phillies were without Victor Arano due to shoulder soreness so Kapler rode Dominguez into the ninth after using him for two batters in the eighth. The Phillies were three outs away from a win when Dominguez sputtered. It was clear he was out of bullets when he started the ninth with consecutive walks. Three outs would not come easy. The Nationals tagged Dominguez for two runs and he exhausted 43 pitches before loading the bases with two outs. Luis Garcia entered, walked the first batter he faced to tie the game, and then struck out Bryce Harper to strand the bases loaded. The strikeout only delayed the loss. "It's frustrating for everybody here because everybody is just trying to go out there and do everything that they can do to help the team to win," said Maikel Franco, who left the game with a shoulder contusion and neck soreness after flipping over the guardrail while chasing a foul ball. "You're seeing that nothing is happening for us. You feel frustrated." Maikel Franco (right) flips over a railing while chasing after a foul ball hit by the Nationals’ Adam Eaton during the eighth inning. Franco suffered a contusion and neck soreness. Tuesday night became a needed win after the Phillies' limped to a 3-1 loss in the afternoon. The Phillies entered the nightcap trailing Atlanta by 5½ games and a owned a record that was just five games above .500. A division title seems out of reach, but a winning record may be slipping away, too. "When the last game doesn't go the way you want it to go, you turn the page and get ready for the next game," Kapler said outside his office before the second game. The Phillies seemed to turn the page in the second game by racking up 13 hits after totaling just five in the first. Rhys Hoskins' game-tying double highlighted a five-run fifth inning after the Phillies fell into an early three-run hole. Wilson Ramos had three hits and Asdrubal Cabrera added an RBI double. Jose Bautista added some comfort with a homer in the eighth. But it was all wasted. "It just didn't pan out. It has been going that way for us for a little while now," Arrieta said. "We have to pick it up and if we don't we're not going to be making the playoffs." If the Phillies were to make a run, this would have been the time. They play seven more games before flying to Atlanta for a four-game series with the Braves. The Phillies play seven of their final 11 games against Atlanta. But it is shaping up to be a challenge for those games to carry the meaning they once seemed guaranteed to hold. In their last 22 games, the Braves have won 13 times and the Phillies have won six. That is how they pulled away. "It's not over until we're eliminated," Arrieta said. "Just have to keep doing what we can to try and win each and every day. Even though that hasn't panned out the way we would like the last few weeks, you know we're going to keep plugging away." The Phillies started the ninth with Andrew Knapp walking and Cesar Hernandez getting hit by a pitch. They had two runners on with the season on the line. Rhys Hoskins popped up, J.P. Crawford grounded into a fielder's choice, and Carlos Santana was intentionally walked to load the bases after new reliever Wander Suero nearly balked on his first pitch. Jose Bautista flew out to end the inning. The page was lifted, but it was unable to be turned.